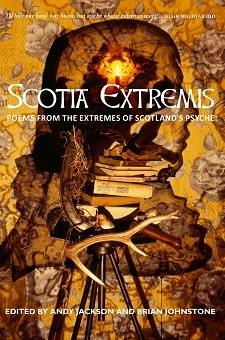 This is an anthology of poems inspired by aspects of Scotland and predicated on the idea that Scotland is a place with a split personality, veering between extremes. The editors put up online a list of topics, which were then chosen by individual poets. In fact the topics came in pairs, though the poets worked alone, to suggest these extremes. I'm not sure the idea itself convinces me, because the older I get, the less I believe in so-called national characteristics and the more I incline to the view of Confucius – "people's natures are alike; it is their habits that drive them far apart". Yes, Scots, or some of them, have "attitude", as several poems suggest; so do Danes and Russians and no doubt so did ancient Babylonians. But because the poets chose their topics, rather than being set them, there is a lot of interest in how each interpreted the aspect they chose. and the cured flesh peeling easily from the bone. Here again, though local references abound, the experience was universal; Anne Berkeley's collection The Men from Praga (Salt 2009) records just such a bomb-haunted 60s childhood at the other end of Britain. Some poems, of course, do focus more on their particular, nominal subjects. Dawn Wood and Marjorie Lotfi Gill, paired to write about artists Joan Eardley and Eduardo Paolozzi, both enter sensitively into their subjects' ways of working, while Angus Peter Campbell in "William Topaz McGonagall", does a fine job of imitating his subject's cadences without, I'm glad to say, mocking him, for he was a man who deserved better than mockery. I was glad also to see a concrete poem a la Edwin Morgan – Rebecca Sharp's "The Declaration of Barrbru"- for one problem with this project was that Mr Morgan had already dealt so well with some of these topics that I was hearing his voice instead of those on the page. He needed to echo in this book somewhere. The most interesting poems, perhaps, were those that somehow managed to find an unexpected angle on their subject, and where how something was said became at least as important as what was said. Tracey Herd's gripping little psychodrama "Bible Joanne", Tessa Berring's freewheeling "Caryatid" and Gerry Loose's incantatory "Gruinard Island" are among them. With this format – different aspects of a nation – there will be both something to please most people, also something that goes over their heads, for generational or other reasons (from the poems where they appear, I gather Orange Juice and Arab Strap must be bands, but frankly they might be Chinese emperors for all I knew). It's a very diverse, lively anthology and very nicely produced. A deil o a broth, as Dilys Rose remarks in "Cullen Skink".